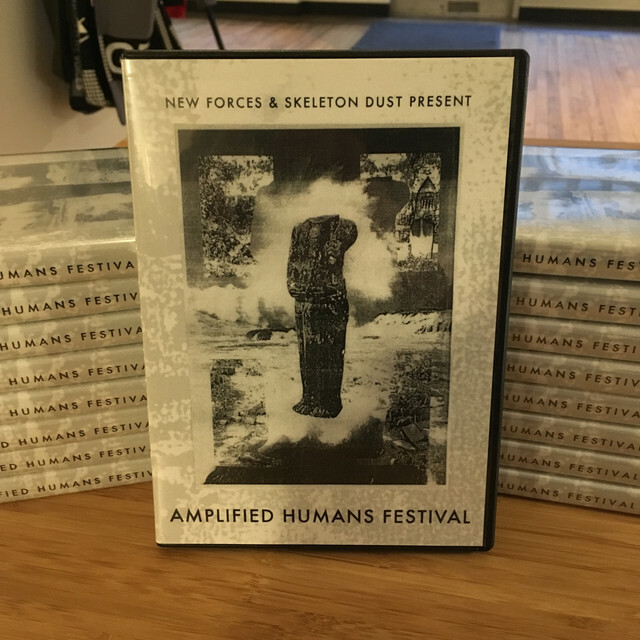 This 2-disc DVD set captures, in their entirety, all 25 performances at the 2016 Amplified Humans Festival in Dayton, Ohio. Shot from three camera angles by Jay Linski (Bullart Video), and accompanied by sound-board audio engineered by Andy Czuba, this is the next best thing to having attended the festival. With more than 5 hours of footage across two professionally manufactured DVDs, you can view the performances from start to finish or use the menu to select individual sets. See the rapid-fire Japanoise mastery of Killer Bug, Kazuma Kubota, and Facialmess. Watch The Rita perform walls of underwater snorkel-noise while submerged in a basin of water. Enjoy the tense sonic manipulations of John Wiese. And watch Aaron Dilloway turn in a now-legendary performance that rests at the top of the "best set ever" list for many of the festival's attendees. These are just a few of the amazing performances captured on this DVD which also features a soundtrack composed by Blessed Sacrifist. A chance to relive an unforgettable weekend for those that attended, and an essential noise document for those who weren't there. Full performances by: Killer Bug, Kazuma Kubota, Facialmess, Knurl, Kazumoto Endo & Kazuma Kubota, Richard Ramirez, Aaron Dilloway, The Rita, John Wiese, Scalp Elevator, Rodger Stella, Paranoid Time, T.E.F., Plague Mother, Worth, Deterge, Kakerlak, Skin Graft, A Snake In The Garden, Diaphragmatic, Harness, Action/Discipline, Alex York, and Daniel Rizer. Edition of 300 copies co-released with New Forces.